Oh Vincenzo what were you thinking….??? There should be a former Tour de France, La Veulta and Giro winner, smacking his forehead and saying ‘Stupid, stupid, stupid, stupid’ or in the Sicilian dialect ‘Stunatu, stunatu, stunatu, stunatu’. Mr Nibali and Mr Shefer of Team Astana – what were you thinking? You both have been thrown out of La Vuelta 2015 for a flagrant ‘sticky bottle’ work with your team car. Speaking of people that should be kicking themselves, WTF was going on with Stage 1 of the 2015 version of Vuelta. Compacted sand and rubber matting on a TT course that was barely 2 metres wide for its 7km length?? What were the race organisers thinking?? 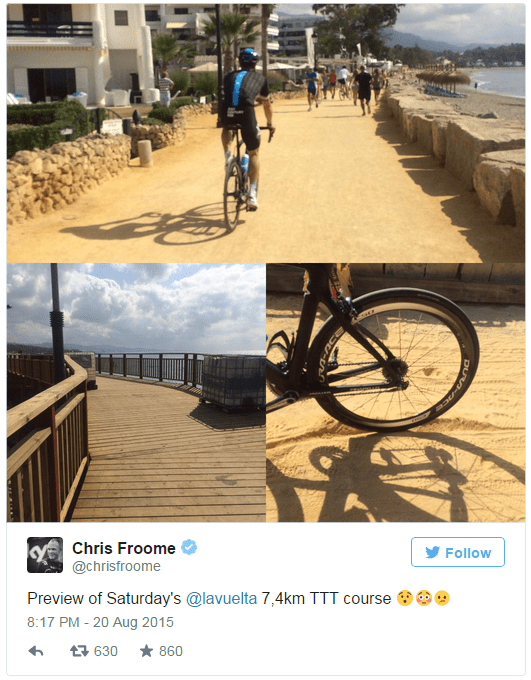 I think Chris Froome’s twitter photos give you a pretty good idea why the Peloton were so unhappy. Notwithstanding, BMC Racing won the event with Orica GreenEdge finishing third. 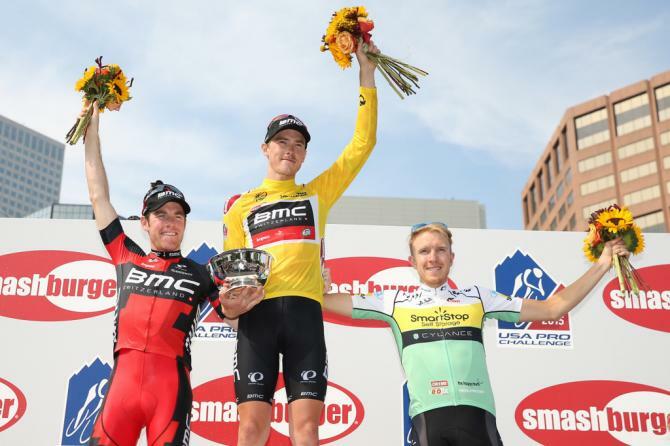 Finally, a big ‘Chapeau’ to BMC Racing’s resident Aussie Rohan Dennis who has just won USA Pro Challenge. He finished 40 seconds ahead of his American team-mate Brent Bookwalter. There you have it two winners and 2 losers in the wonderful world of UCI. This entry was posted in Grand Tour, UCI Events and tagged BMC Racing, Chris Froome, La Vuelta, orica-greenedge, Rohan Dennis, Stupid, Vincenzo Nibali, WTF on August 24, 2015 by Marv.